Hoffman Comline 1-Door OSP enclosure package features aluminum construction for longer endurance. This RAL 7035 enclosure featuring light-textured low-gloss polyester urethane powder-coated finish over iron phosphate-treated surface offers immense resistance against impact, moisture, abrasions, corrosion, chemicals, weather, scratches and UV rays. It measures 23.62-Inch x 35.43-Inch x 19.68-Inch. Heavy-duty hinged door allows to remove easily, which facilitates quick equipment installation and removal. 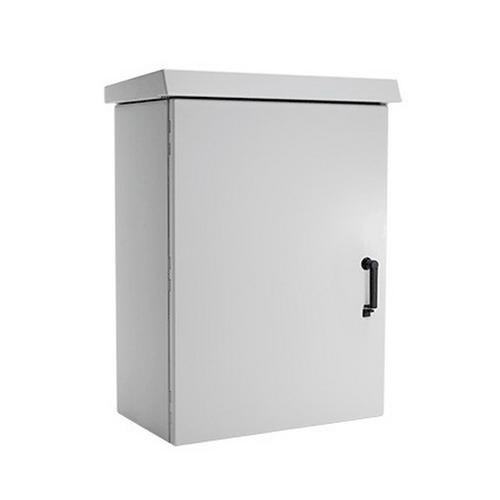 NEMA 4X enclosure secures and protects sensitive equipment in outdoor applications. Stainless steel fasteners resist corrosion effectively in order to maintain professional appearance. Padlocking L-handle of this enclosure offers tight as well secure door seal. Body comes with studs for ground bar and rear mounting studs for wood panel. Enclosure is UL listed, CSA certified and RoHS compliant.